Your safety is vital while traveling on unincorporated County roadways. This is why Los Angeles County is setting a goal of zero traffic deaths on unincorporated County roadways by 2035. An Action Plan is essential to accomplish this ambitious goal. Provide feedback to help guide the County's efforts in enhancing traffic safety in unincorporated Los Angeles County communities. What is the purpose of this ACTION PLAN? 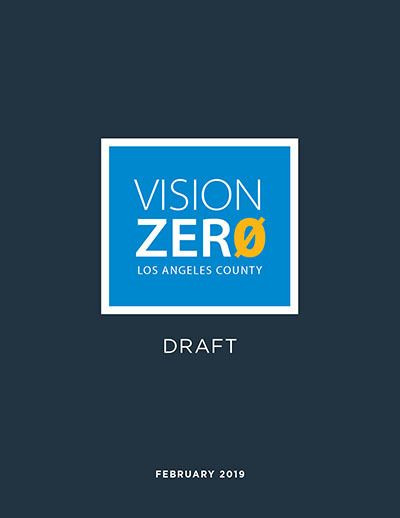 This Vision Zero Action Plan will focus the County's efforts on reducing traffic deaths and severe injuries on unincorporated County roadways over the next five years. It creates the vision for the future and sets goals and actions to enhance traffic safety in collaboration with agencies and community partners. We would like to hear from you. Please submit your comments online through the e-form, or reach us by email, phone, or mail. We greatly appreciate your feedback.